Congratulations to all of the Players and the moderator team of Will-ABC, Fran-E, Ann Marie and Memento as the ABCs game passed 10,000 views this morning. (I admit I actually was viewer #10,000 when I went to check on the thread this morning to see if it had made 10,000 yet.) Good work to all! Oh, my! You know, at first I thought there was a mis-print and was meant 1,000. Oh, my goodness..... 10,000 looks. 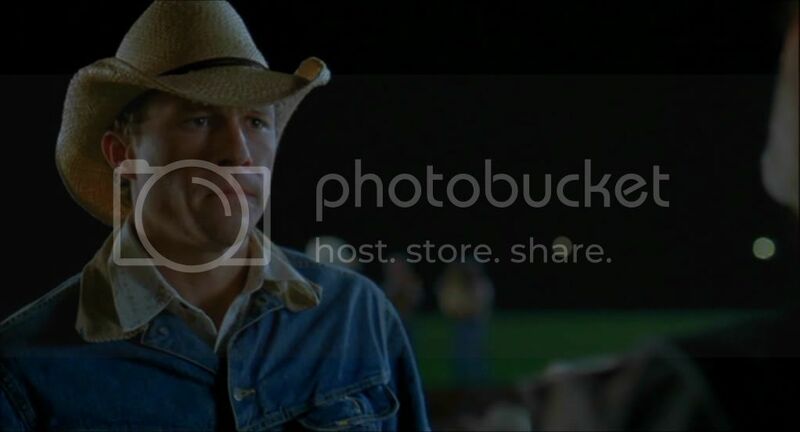 I must say that this smart game is a wonderful tribute to the true Brokeback Mountain story and my beloved son Jack and my son-in-law Ennis del Mar. I must express my appreciation to all of those stated who make this possible here at the forum. God bless all of you. I'm sorry, but I don't have a Q as a good word. What I do have is some hot coffee with cream and sugar and some homemade sweet cherry cake. You come back and see us soon. We'll have fresh hot coffee and homemade cherry cake! May I add my "Yeeehhaaaaaaaaawww" to Phillip's sentiment on this! Good job Will-ABC, Fran, AnnMarie, and Memento! and I can never post the W or X that I have on file if we sit around congratulating each other. If we can't fix it, we have to stand it - for a while. I just want to add that if it weren't for our founder and mayor, none of us would be here. This game has given us all joy, frustration, and addiction as evidenced by one of our players pictured below. Congrats to all the playerz, modz and of course Mayor Will, who without there wouldn't be one ABC view, let alone 10,000! What a testament to a wonderful movie and game. And to you, AnnMarie, who got the game started here at BetterMost! Congratz "ABCs" for 10,000 posts!!! CONGRATULATIONS to the game -- the "ABCs of Brokeback Mountain" -- that I 'courageously' created at the IMDB's real wild West at BBM! After the "ABCs" broke records -- and more -- there, I ultimately brought the popular game here to the BetterMost Forum, as greatly facilitated by Administrator Phillip and convincingly by co-Moderator Ann Marie and greatly aided in the "ABCs" kick-off by Fran-E. Becuse the game is so popular and busy, almost all of the time, I added Memento last month as a needed additional moderator. As is well-known, the comprehensive "rulez" and "guidelinez" of the "ABCs" is the rudder and the key reason that the ship is not only still afloat but sailing full steam ahead. I humorously recall when one of the posters -- ironically, she's still around -- thought the game was "too rigid". Ha! Ha! Hmm! With well over 10,000 views and counting, it's hard to argue with success -- big time!! Thanx to ALL of the "ABCs" Players -- even those few who are sometimes a payne in the brayne. The people here have proven over and over again that the "ABCs" is much more than just a game! From my part, I am happy to bring so much discussion, fun, information and friendship to so many people. It emulates the real spirit of Ennis & Jack's BBM. And, Phillip D., U did a nice and effective gesture with the terrific banner of congratulations and appreciation for the "ABCs". Re: Congratulations on ABCs 10,000 views! Congratulations to all my fellow players and a humble thank-you to the moderators and mayor for creating and shepherding this game, keeping to the narrow and rocky, but rewarding path! And to Will-ABC, thank you for your absolute brokebacking character, courage, and creativity! Just like the movie, you've stayed dedicated to your vision. Though it can be brain boggling and maddening at times, ABCs is the foremost and bettermost game that can be found anywhere on a message board, hands-down! p.s. Oh by the way, Toast, you collect Ws and Xs? Good to know--I collect Zs. Wow, this sure is a milestone. Congrats to all my fellow players and our brilliant moderators. Good for you, Lee on your posts. Feels like we just started, didn't it? And Will, if it wasn't for this game, you and I would not have met and formed this wonderful friendship, that I will always cherish..
Let's keep it going peeps!!! Wow! This is amazing! Congrats to the creator, our dear Will, all the mods and of course, the players! Totally cool congratulations to all the clever and erudite folks who play this game so well and to Will, Fran, Ann Marie and Sandy! You guys are terrific! Those 3 pix of the three cats are luv-lee!! Meow! They are so happy and havin' much fun. 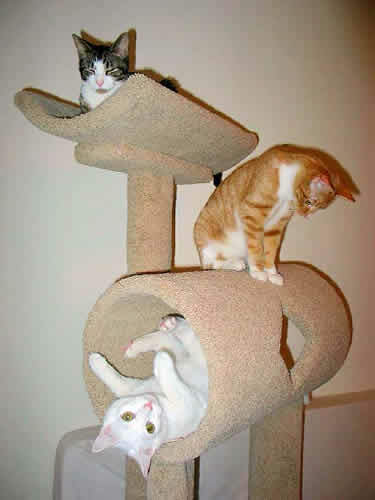 That multi-tiered cat tree is nice and expensive, too. Meow! I have one cat now (I think U saw the pic of Quicksand) and AnDre has one cat (who annoys mine at least twice daily just as Dre annoys me at least twice daily). We lost one other cat less than two months ago, which is still upsetting to both of us, although Zebrina lived to be a happy and active 17 1/2 years old. Anyway, thanx for the congratz! Meow! What great words from somewhere beyond the sea. I luv it! Your fireworks is a beautiful, moving and colorful tribute -- very BBM! Plus, the fireworks even enlarge. It is such an honor to have U here at the BetterMost BBM Forum that I cannot even begin to say how much except that I must acknowledge the mesmerizing portrayal of your real-life scene with Ennis! Re: Congratulations on the "ABCs" 10,000 views! This celebration demands for fireworks. Click to enlarge. More than 10 000 views and 100 pages - that's amazing. Thanks to all moderators for watching so carefully, for taking the effort and for always keeping the played answers list up to date. Congratulations to all for reaching this momentous milestone! Kudos to our Chief, Will, the Moderators, Phillip, and all the family members we’ve become! I’m so tickled to be a part of this ongoing party! Onward to more squiggly numbers! Oh my god! Sorry I have only just found this thread with all of Will's subtle hinting I felt guilty every time I did not have enough time to post here. So sorry, but I would like to congratulate all the regular players(and of course Mods) cause you are so imaginative and just pure briliance. I of course would also like to thank my dear friends Will and Fran for creating this game and the answers list, also for being briliant game mentor. Keeping me on the straight and narrow and guiding me back to the golden path of righteousness that is the rules. And of course our newest Mod Memento, although I have yet to speak to you or have any of my posts corrected by you(I must be getting better at this ABCs malarchy, or maybe I am just kidding myself) but you seem a really nice person and I would love to get to know you sometime soon. Is it me or do you guys think it is time to bring back the Willies? So this is to all, but especially our creator Will, you are a complete star! I'm sitting somewhere between 10K and 15K views! Congratulations to our wonderful Moderators, our oh so clever players and the film that keeps us fueled with fun! Congratulations on the "ABCs" 15,000 views! and ROUND 100!! WOW!!!! Over 15,000 views! ROUND 100!!!! All you clever "ABCs" players with your quick wits and huge vocabularies left me in the dust long ago. Job well done all I tip my hat to you, everyone!! That is the most fun animation I've seen at the "ABCs". That cute and happy monkey reminds me a bit of Dre! U are part of its longtime success. Thank U, too. Re: Congratulations on the "ABCs" 15,000 views and Now Round 100! We have lots to celebrate today. BetterMost hit 1,000,000 page views today since starting in February of this year, and now we have Round 100 for the ABC Game! My congratulations to all of the moderator team and all of the great players! ABCs of BBM =milestone= 100 Roundz!!!!!!!!!! That a group of people -- about 50 or more -- can successfully work and master and complete an endeavor like this is quite a proud feat, especially on the internet! What makes it all possible too is the multi-featured, orderly and safe space here at the BetterMost Forum. Guiding, overseeing and helping the "ABCs of BBM" Playerz is our dedicated, smart and friendly team of Fran, Ann Marie and Sandy as moderators in addition to myself. Besides the "ABCs" game, also involved in moderating and inputting are the separate and accompanying files of the "ABCs Answerz List" (which gets updated five or six times per day) and the "ABCs Playerz" in addition to "Lines =U= Won't Hear in BBM" and several smaller files. There have been many games of the "ABCs" of a movie, an event or an artist but none that come anywhere near the out-and-out record-breaking of the "ABCs of BBM". The others, typically mis-managed or un-managed, go astray and/or die out. This BBM "ABCs" is powerful besides very informative, entertaining and fun. Re: Congratulations on the "ABCs of BBM" Round 100! Re: Congratulations on the "ABCs of BBM" 100 Rounds! I am so pleased to be associated with this game. It has successfully taken my mind off of daily annoyances that were getting me down and turned around completely my frame of mind. Plus I have made friends for life, I feel! I hope to celebrate in person with at least some of you and recite the ABCs lovingly to others when you return from your ramblings (you know who you are!) Thank you especially to our ever-patient moderators Fran, Sandy and AnneMarie, for herding us cats so gently, and above all to Mayor Will who rules this game with shock and awe!! In honor of 16,000 views and 100 rounds! A little magic bunny luv for the wonderful folks of the ABCs of Brokeback Mountain game!!! CongratZ on 8,000 postZ to the "ABCZ of BBM"
CONGRATULATIONZ to the endless love of the ABCz! Newest record for the ABCz of BBM is 8,000 postz! Time again to change the title of this changing heading. Becky - your cartoon is the Bx. bomb! Juliette - good to see You back at game! Mandy - You owe me a call/I owe You a pic! Gee, I remember vividly when there was 1 post: mine! And, then, two: mine and Ann Marie's!! And, three: mine, Ann Marie's and Fran's!!! It's truly an internet incredibility for such teamwork! Yay! Congratz to us all! So nice to see you back again, Will, Mandy, and Victoria. Missed U--you too, Dre! ABCz of BBM =milestone= 300 Roundz!!! who created and guided the ABCz game and wrote its constitution and bill of rights, which has kept the game, the modz and the playerz on the BBM game track!! You're welcome! Hay!! There's another dog on the forum. Yippeee! Come here and let me smell you! What would Heath Ledger do? I decided to pay the ABCs another visit today. And lo and behold, I chose the right day . Love your current theme! 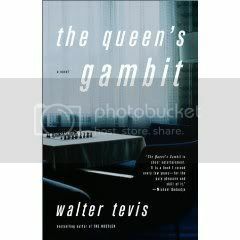 If Heath Ledger had made a first full-length film, it would have been The Queen's Gambit, based on the novel by Walter Tevis. I just got caught up on the amazing ABCs thread. What a work of collaborative creativity! I love it! Thank you, Fran, Sandy, Paul, Meryl, Sonja, and all the other Brokies who have cycled into the game. Round 885--wow!! 885 rounds times 26 letters equals . . . 23,010 posts!! I know you guys have retired some letters but, still, that's gotta be a lotta posts!!!! rom the look in Ennis's eye, it became crystal clear to Biker #1 that he was not going to leave the fireworks celebration undamaged. This pic got me unawares. Still quite an impact, after all this time. Thanks for posting, Meryl. Thanks for noticing, Chrissi. And thanks to Striped Wall for the fabulous resource.